by Daniel J. Barrett, Ph. D., Richard E. Silverman, and Robert G. Byrnes. 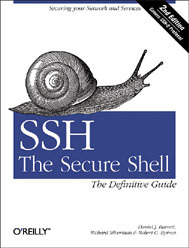 This site is operated by the authors of the O’Reilly book on SSH. The first edition was published in February of 2001, by Dan Barrett and Richard Silverman. Joined by Robert Byrnes, we completed the second edition in May of 2005. We have also written O’Reilly’s Linux Security Cookbook. SSH is based on IETF standard protocols.